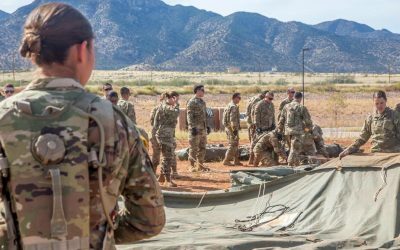 It turns out that sending nearly 6,000 active-duty troops to the southern border was more than a $72 million (and counting) effort to bolster GOP prospects for the midterm elections. It may have been the beginning of the end for the 1878 Posse Comitatus Act. On November 20th, the Trump admin signed a memo directing active-duty troops to take on law enforcement roles, including authorizing the use of lethal force, for the first time along the southern border. Law professor Marjorie Cohn explained in a Truthout op-ed last week, “Passed in 1878 to end the use of federal troops in overseeing elections in the post–Civil War South, the Posse Comitatus Act forbids the use of the military to enforce domestic US laws, including immigration laws. 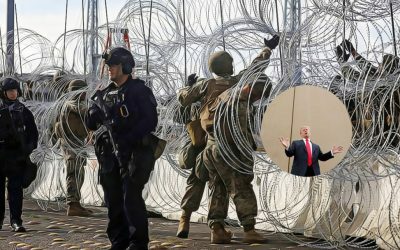 For this reason, Trump’s decision to deploy the military to the border to enforce US immigration law against thousands of desperate migrants from Central America — who have undertaken the perilous journey over 1,000 miles through Mexico to the US border in order to apply for asylum — is an unlawful order.” Up until now, military brass was able to claim a limited support role that didn’t violate the law. That’s gone now. “The [Posse Comitatus] law was originally intended to protect the states from being controlled by federal troops. It has evolved into a singly defining, almost church versus state-type wall forbidding active-duty forces under the control of the president from conducting any types of crowd control or law enforcement domestically, essentially ensuring that the US military is not used to control or defeat American citizens on US soil,” explains Tara Copp in the Military Times (11/21/18). In schools across America, US history teachers, for decades, the have taught that unlike in foreign countries, the US military doesn’t police American streets, stage coups, declare martial law, and isn’t used by rulers against domestic political adversaries. The basis for those norms has been the law that Trump is attempting to scrap. “Farewell Posse Comitatus, 1878-2018. It was good to know you these last 140 years you kept us safe from military dictatorship,” shared the author who coined the term ‘mansplaining,’ Rebecca Solnit, on social media as an obituary to the federal act that was updated in 1956 and 1981. While courts have ruled that the President may use the military to suppress insurrection or enforce federal authority, this order doesn’t refer to any emergency beyond an asserted belief that the US shouldn’t follow existing law (specifically the 1951 Refugee Convention) in processing claims by asylum seekers. The other exception is “in cases and under circumstances expressly authorized by the Constitution or Act of Congress,” which has not, and is not likely, to occur. “The Uniform Code of Military Justice (UCMJ) requires that all military personnel obey lawful orders. Article 92 of the UCMJ says, “A general order or regulation is lawful unless it is contrary to the Constitution, the laws of the United States….” Both the Nuremberg Principles and the Army Field Manuals create a duty to disobey unlawful orders,” explained Professor Cohn in Truthout. 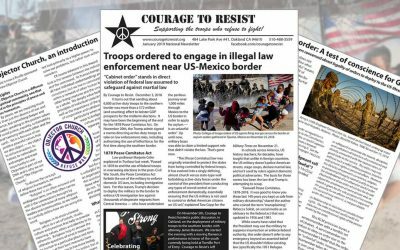 Courage to Resist, Veterans For Peace, and About Face, have been distributing an open letter to soldiers on the border entitled, “Don’t turn them away: The migrants in the Central American caravan are not our enemies.” So far troops that have been approached with leaflets seem clearly concerned about their mission, but are also fearful of taking what is seen by the military as “propaganda.” This underscores the need for social media outreach, both friends sharing posts as well as the strategic paid ads that Courage to Resist is fundraising for. We can’t let this become the new normal. 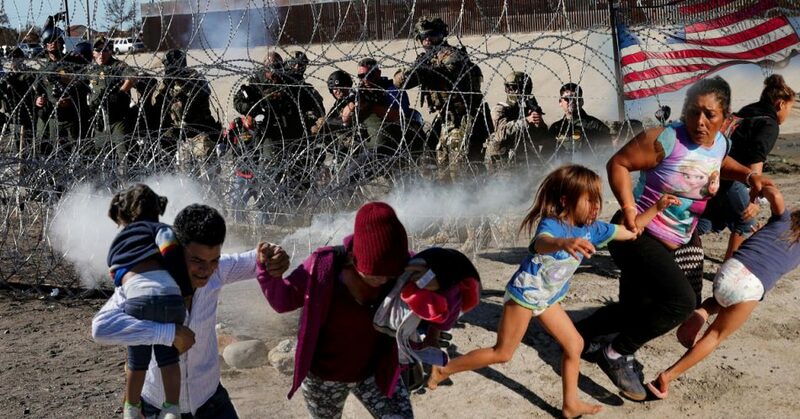 Featured image (top): Collage of images taken of US agents firing tear gas across the border at asylum seekers gathered in Tijuana, Mexico on November 25, 2018.